While ecological processes are known to drive adaptive evolution, the feedback from adaptive evolution to ecological processes has been explored mostly in theory and simple model systems. These explorations suggest a potentially profound importance for the feedback from evolution to ecological processes. Yet the importance of adaptive dynamics in natural systems remains to be elucidated; to do so requires a target organism that can display significant evolution in a manageable interval of time in a context where the ecological consequences can be measured. We will, for the first time, experimentally evaluate reciprocal feedbacks between evolution and ecosystem processes and hence evaluate such theory in a natural setting. We do so using a focal species, the guppy (Poecilia reticulata), in which rapid evolution of body size, life histories and other traits have already been documented. Prior results suggest that feedbacks between evolution and ecology are important in this system because some evolutionary changes we have observed are inconsistent with theory that does not include ecological interactions. We propose to transplant guppies from sites where they co-occur with a diversity of predators to streams from which they have been previously excluded by waterfalls and that contain a single predator, Rivulus hartii, then to evaluate ecological and co-evolutionary interactions that result. Rivulus preys on guppies, but guppies also prey on Rivulus and the two species compete. Our experimental setting benefits from additional barrier waterfalls that limit upstream dispersal of guppies, but do not exclude Rivulus, thus providing a built-in control. We also will manipulate light environments of a subset of experimental sites in order to alter basal resources and assess how ecological context influences evolutionary trajectories. Research in focal streams will be complemented by experiments conducted in existing artificial channels designed to identify underlying interactions and examine cause-and-effect relationships implied by the introduction experiments. 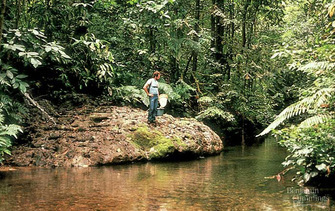 Comparative studies across a wide variety of streams and fish communities will be used to refine experimental results. > isotope tracer experiments to quantify nitrogen flux through ecosystem compartments. Our research program represents the first comprehensive effort to experimentally study ecology and evolution in a natural ecosystem. Because the proposed research explicitly links theory and experimentation in an iterative manner, this work will produce a general conceptual framework that can be applied to other ecosystems. For example, our results will be applicable in conservation biology and the management of exploited populations. Human activity frequently introduces exotic species, reduces abundance of native species, and alters ecosystem processes. Consequences of these changes are often studied in an evolutionarily static framework. We argue that incorporating evolutionary change can improve our understanding of the consequences of human induced changes to the environment. For example, introduced species often are initially restricted in their distribution, then abruptly proliferate to become invasive pests. This change may well be caused by evolution of the invader after it becomes established. As a second example, guppies have served as an evolutionary model for the likely consequences of fishing on commercially exploited fish populations. Commercially exploited fish show phenotypic changes in life histories that parallel the way guppies evolve under predation; they often do not recover or recover very slowly when fishing stops. Two possible reasons for delayed recovery are that exploited populations have evolved and the structure of the ecosystem has changed. The proposed research will substantially improve our ability to incorporate eco-evolutionary interactions into these other disciplines. This research will build a theoretical and operational framework for collaboration across a breadth of biological disciplines.